Microsoft Excel has a number of helpful time features and knowing them a little in depth can save you a lot of time. Using special functions, you can insert the current date and time anywhere in a worksheet, convert time to a decimal number, sum different time units or calculate the elapsed time. To be able to leverage powerful Excel time functions, it helps to know how Microsoft Excel stores times. So, before digging deeper into the formulas, let's invest a couple of minutes in learning the basics of the Excel time format. If you have been following our Excel Dates tutorial, you know that Microsoft Excel stores dates as sequential numbers beginning with January 1, 1900, which is stored as number 1. Because Excel treats time as a portion of a day, times are stored as decimal fractions. When both a date and time are entered in a cell, they are stored as a decimal number comprised of an integer representing the date and a decimal portion representing the time. For example, 1 June 2015 9:30:00 AM is stored as 42156.3958333333. 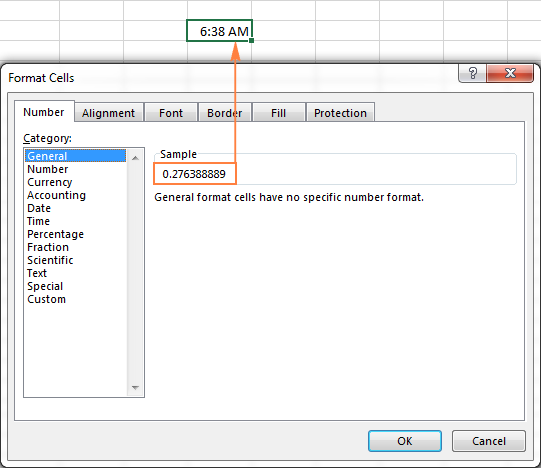 A quick way to pick a decimal number representing a certain time is to use the Format Cells dialog. Simply select a cell containing the time and press Ctrl + 1 to open the Format Cells dialog box. On the Number tab, select General under Category, and you will see the decimal in the Sample box. Now, you can write down that number and click Cancel to close the window. Or, you can click the OK button and have the time replaced with a corresponding decimal number in the cell. In fact, you can think of it as the fastest, easiest and formula-free way to convert time to decimal in Excel. In the next part of our Excel Time tutorial, we'll take a closer look at special time functions and calculations to convert time to hours, minutes or seconds. Microsoft Excel is smart enough to recognize a time as you type and format the cell accordingly. For example, if you type 20:30, or 8:30 PM, or even 8:30 p in a cell, Excel will interpret this as a time and display either 20:30 or 8:30 PM, depending on your default time format. 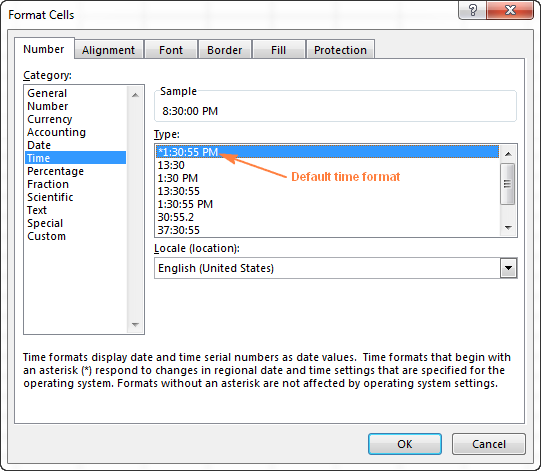 If you want to format some numbers as times or apply a different time format to existing time values, you can do this by using the Format Cells dialog, as demonstrated below. In an Excel sheet, select the cell(s) where you want to apply or change the time format. Open the Format Cells dialog either by pressing Ctrl + 1 or by clicking the Dialog Box Launcher icon next to Number in the Number group, on the Home tab. On the Number tab, select Time from the Category list, and choose the desired time format from the Type list. Click OK to apply the selected time format and close the dialog box. Though Microsoft Excel provides a handful of different time formats, you may want to create your own one that fits the best for a particular sheet. To do this, open the Format Cells dialog box, select Custom from the Category list and type the time format you want to apply in the Type box. The custom time format you've created will be in the Type list the next time you need it. Tip. The easiest way to create a custom time format in Excel is to use one of the existing formats as a starting point. For this, click Time in the Category list, and select one of the predefined formats under Type. After that switch to Custom and make the changes to the format displayed in the Type box. When creating a custom time format in Excel, you can use the following codes. Tip. To create custom formatting for dates and time, use various combinations of time codes and date codes. When you are calculating times in Excel, a cell containing the sum of time amounts may exceed 24 hours. To get Microsoft Excel to display times beyond 24 hours correctly, apply one of the following custom time formats. Display an error message . Type a semicolon at the end of the time format, and then type a message in quotation marks, e.g. [h]:mm;"Negative time"
Generally speaking, a semicolon acts as a delimiter to separate positive values' format from negative values' formatting. If you want to display negative times as negative values, e.g. -10:30, the easiest way is to change the Excel's Date System to 1904 date system. To do this, click File > Options > Advanced, scroll down to When calculating this workbook section and check Use 1904 date system box. 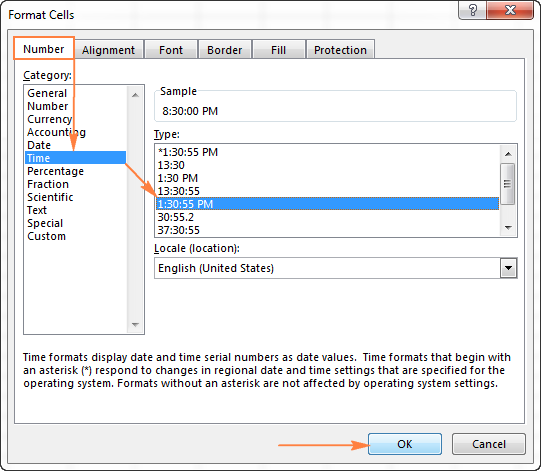 When changing the time format in the Format Cells dialog, you may have noticed that one of the formats begins with an asterisk (*). This is the default time format in your Excel. To quickly apply the default Excel time format to the selected cell or a range of cells, click the drop-down arrow in the Number group, on the Home tab, and select Time. 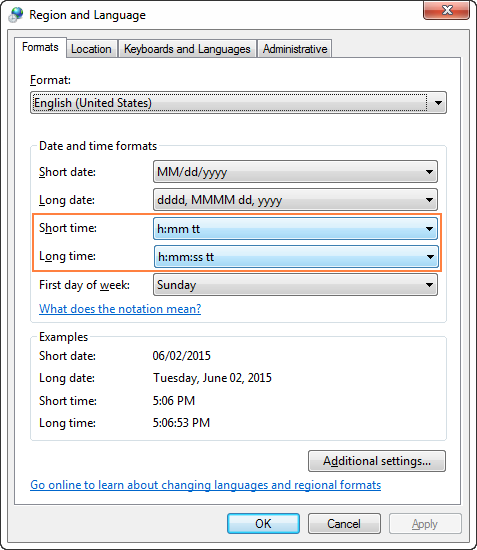 To change the default time format, go to the Control Panel and click Region and Language. If in your Control panel opens in Category view, click Clock, Language, and Region > Region and Language > Change the date, time, or number format. Note. When creating a new Excel time format or modifying an existing one, please remember that regardless of how you've chosen to display time in a cell, Excel always internally stores times the same way - as decimal numbers. There are a numbers of ways to insert time in Excel, which one to use depends on whether you want a static timestamp or a dynamic value that updates automatically to reflect the current time. To enter the current date and time, press Ctrl + ; which inserts a date, then press the Space key, and then hit Ctrl + Shift + ; to insert the current time. If you aim to insert the current date and time as a dynamic value that refreshes automatically, then use the Excel NOW function. The NOW function retrieves time from your computer's system clock. NOW is one of Excel's volatile functions that cause the cell with the formula to recalculate every time the worksheet is re-opened or recalculated. To force the Excel NOW function to update the returned value, press either Shift + F9 to recalculate the active worksheet or F9 to recalculate all open workbooks. To get the NOW function to automatically update at a specified time interval, add a VBA macro to your workbook, a few examples are available here. Use =NOW() formula, and then apply the time format to a cell(s). Please remember, this will only change the display format, the actual value stored in a cell will still be a decimal number consisting of an integer representing the date and a fractional part representing the time. The INT function is used to round the decimal number returned by NOW() down to the nearest integer. And then, you subtract the integer part representing today's date to output only the fractional part that represents the current time. Since the formula returns a decimal, you will need to apply the time format to the cell to make the value display as time. 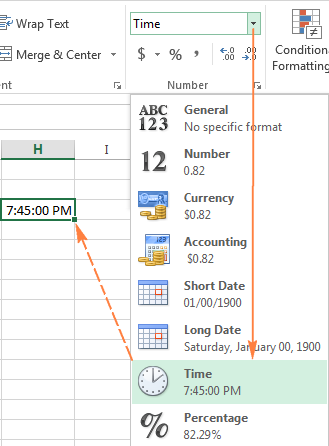 The TIME function in Excel is used to convert a text string showing a time into a decimal that represents the time. The hour, minute and second arguments can be supplied as numbers from 0 to 32767. If hour is greater than 23, it is divided by 24 and the remainder is taken as the hour value. For example, TIME(30, 0, 0) equates to TIME(6,0,0), which is 0.25 or 6:00 AM. If minute is greater than 59, it is converted to hours and minutes. And if second is greater than 59, it is converted to hours, minutes, and seconds. For example, TIME(0, 930, 0) is converted to TIME(15, 30, 0), which is 0.645833333 or 15:30. The Excel TIME function is useful when it comes to merging individual values into a single time value, for example values in other cells or returned by other Excel functions. HOUR(serial_number) - returns an hour of a time value, as an integer from 0 (12:00 am) to 23 (11:00 pm). MINUTE(serial_number) - gets the minutes of a time value, as integers from 0 to 59. SECOND(serial_number) - returns the seconds of a time value, as integers from 0 to 59. In all three functions, you can input times as text strings enclosed in double quotes (for example, "6:00 AM"), as decimal numbers (e.g. 0.25 that represents 6:00 AM), or as results of other functions. A few formula examples follow below. =HOUR(A2) - returns the hours of the timestamp in cell A1. =MINUTE(A2) - returns the minutes of the timestamp in cell A1. 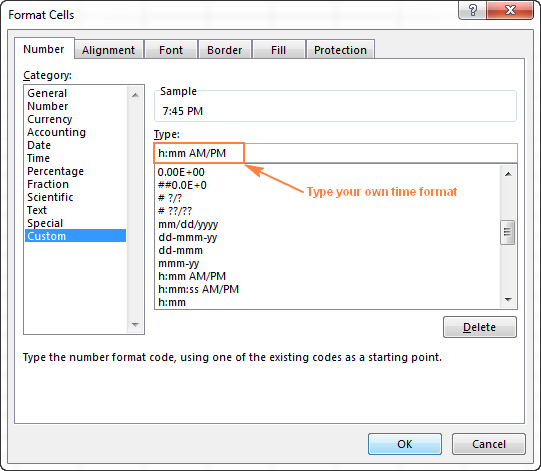 =SECOND(A2) - returns the seconds of the timestamp in cell A1. =HOUR(NOW()) - returns the current hour. Now that you've got down to brass tacks of the Excel time format and time functions, it will be much easier for you to manipulate dates and times in your worksheets. In the next part of our Excel Time tutorial, we are going to discuss different ways of converting time to numbers. I thank you for reading and hope to see you on our blog next week! 95 Responses to "Excel time format & how to use NOW and TIME functions to insert time"
Sorry, I am not sure I can follow you. Could you elaborate a bit? I want the negetive time to show as ZERO when subtracting the time..
Hi Svetlana, is there any wy I could insert the time greater than 24h (80 hours for example) using TIME(hh;mm;ss) function? Or is there any solution to compare the time... Ig the time is greather or equal to 80h? My query is,I will have to maintain In time and out time register for our staff to monitor overtime of work for which "I PREPARE FOUR COLUMNS, NAME, FATHER NAME DESIGNATION, GENDER IN TIME AND OUT TIME COLUMN, When I enter in time value, I need the out time value should be fill by counting 9 Hrs. from the time of In time Entry. You may use CONCATENATE functions to combine those two cells. just use =NOW() and format. type '03/01/2015 on cell A1(or on any cell) and '11:34:01 A2(or on any cell). typing apostrophe (') sign before any numerical value or any special character displays it as it is. I want to calculate over time of employees. Would you like to help me in this regards as 10:30PM-10:00AM= ? My time format is set to HH:MM:SS in excel but, it shows as H:MM:SS in spreadsheet, ie: 1:15.00; I want it as 01:15:00. Please help. Whilst certainly not commonly used... I'm trying to keep my spreadsheets presentable and not confusing. How do I get excel to do the same with time; if the cell = ([h]:mm) 0:00, - or "blank"
Regardless of how I write the formula or format the cell, the result shows 'hh:01' and not the time given in the source cell, which itself contains a formula. The source cell lists both date and time, and I'm trying to extract the time. The file is an .xls-file, not sure whether that has an impact. I've run out of ideas of how to solve it, does anyone have a good solution? how to use Sum if for time units sum ?? I have cells that time within for a schedule. I am trying to calculating elapsed time in hours but I need to account for end times that are blank and to count those times as current time or newtwork hours. How to convert DD:h:mm in to H:mm formate For Ex. 02(Day):01(Hours):10(Min.) to 49(Hours):10(Min) in excel. I need to represent data to show the jobs completion time on a given week. On 30th july, the job completed the next day ie 31st july at 12:43 am. since my x-asis has time frame of 0- 24 hours, the graph is not picking the next day completion time. Just wondering how to get the correct duration (time elapsed), for example, between 23:00 and 00:05. I used simple subtraction but it returns negative result. Do you get a different result in your Excel? In time 21.50 ( night 11.50) and closing time 7.00 am but time not calculate can u help me. I have some time based trading data in seconds, but some of the seconds are excluded from the table since no trading happened then. How can I insert the missing seconds? How can i have the time enter automatically when someone selects or clicks a name from a drop down list in a different column. Is that even possible?As opposed to entering time manually.For exmample lets say column B has a drop down list of people and i want the time to auto populate in column q with the start time when someone clicks a name in that cell(B2). Each person would have to manually or short cut the end time. Time can vary between people. Hi - how do I set a conditional formatting that accounts for a potential date change due to the 24hr time? For example, if a therapist visits a patient on X date but at the end of the day 4pm, the date will change to the following day. Can you assist with the formula for this? i have to print a value in another column.The condition is if the time exceeds 12:00:00,add 1. Time is mentioned in H column and the data in which addition is to be done is in column G. The value to be returned is in column J.
I am using formula "=if(G2>"12:00:00",sum(G2,1),G2)".This formula doesn't implement in some cases. How to do it? PS: Time is in 23:59:59 format. Is there a way to format the cell to show GMT-0500 at the end of a date/time cell to indicate the time zone? how could i use =NOW() , which shows time but it will not change/update automatically. when i'll use this then it will only shows insert time only. please help for it. I'm trying to calculate time difference (start time - end time = total time) but also enter start/end times without having to type the colon. If I format the time so I don't type the colon my formulas won't work. I'm using this formula: =TEXT(+H2-E2,"00\:00")+(E2>H2) which works .... but ONLY if the seconds in my end time are larger than start. Otherwise, it calculates based on 100 versus 60 (for time). Is there a way to quickly enter times (w/o the colon) but have it calculate based on 60 minute increment. I am using the form data,and there are n number of rows, since i want to count the current date(today) responses. i have used the formula as below but it is not reflecting the result. if the C:C column is with only date (Without time stampl) it will reflect the result. due the time stamp my formula not calculating the current date. Can you pls help me on this. I would like to track my improvement over time as I run. I would like to design an Excel spreadsheet that I can glance quickly at and see the number of days I have achieved, or nearly achieved, this goal by the color of the cell. Is it possible to design a spreadsheet which works like this? Hello, here is my example. A plane departs at 10/01/2017 01:00:00 and passengers come to gate 02:00hrs prior, which is the previous day 23:00:00. How to subtract those 2 hrs from cell containing 10/01/2017 01:00:00? Many thanks! I have taken static time format and found the time difference by =INT(F25-H25)&" Days "&HOUR(MOD(F25-H25,1))&" Hour "&MINUTE(MOD(F25-H25,1))&" Minutes" this formula. for 04 Days 04 HRS 04 MIN. 3.16997 Days which is exactly what i want. for 00 Days 04 HRS 04 MIN instead of 00d04:04. Hope you understand my query, and please help me to get result 00d04:04 as per above explanation. i am having a problem with the date. Issue : i have a excel sheet i have exported it from a software. When is share this file from personal machine to my work machine the date changes from \ to - but when i send it to my client it works fine from same machine. But in few cells the date is displayed as expected but not in few. this may happen if the date and time are formatted differently on your computers. Please, take a closer look at this part of the article to make sure that you apply one and the same time format on your machines. Can I extract hours from format HH:MM having more than 24 hours. For example, I summed-up overtime for month = 56:34, How can I extract "56" using hour function? I have two cells each with the MS Date and Time Picker Control 6.0 (SP4) in a different cell I want to return the difference in # of business days between the two selected dates. How i can get a current time with the seconds in the excel and also need to get current time in the below cells. I hope someone can help. I have extracted time from an application. When I put it in excel it reads it as a text, that makes sense. Now, I am trying to convert back to time...it reads 126 as 1:26 - the time is actually 00:01:26...I have tried every trick I can think of. Can anybody help me figure this out? I have added daily overtime for the month in format hh:mm. Now I want to display separately Hours and Minutes. 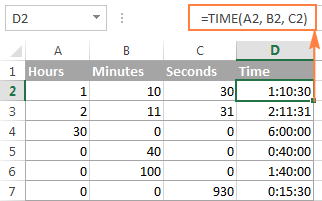 I can extract minutes from formula =Minutes(cell) but for hours greater than 24, it gives me wrong answer. for example, if the hours are 34, formula will minus 24 and give answer 10. Hi How to calculate 108 hrs post from 11/07/2017, 6:00, kindly share the formula. hi, i need help in excel time sheet. I simply want to display AM or PM in a cell based on the current computer time, no time or date. I have tried =IF(A2<0.5,"AM","PM") it will show AM but doesn't change for me when the computer time changes and I refresh the spreadsheet. I've also tried the =NOW() and a custom time format of AM/PM with no time. This seems to be a simple problem but the correct solution has eluded me. 1- The format function is not working on the cell as its an exported data for some reason it doesnot apply to this. The format does change to 7/10/2017 6:58:00 AM automatically on ONLY WHEN I click inside the cell and hit ENTER, but then we have to do this for thousands of cells one by one. 145:59:38 i have a question how do I covert it to seconds. I have a column with Date and Time. I need to write a formula to show, if the date and time is 10-10-2017 12:53 PM, if time is after 2:30 PM the date to change to next date. Please advise. could you please specify where is that "next date" located? Should the formula just return the next date from the list or do you have an additional list? Hi - I'm trying to evaluate a planned timetable against the actual journey times. Generally straightforward (a simple a-b gives the right answer) but if my journey time took less time than scheduled (ie I'm planned to arrive at 10:15 but arrived at 10:05) how can I automatically calculate this to show a response of -00:10? How can i convert to show 24:00:00. Thanks guys hope for you immediate response. how can you get the time elapsed in h:mm from to date & times. example( 12/30/2017 18:16 / 1/2/2018 4:39. What is the time elapsed between these two? How do I add to this formula to start calculating time after a 24hr allotment.... I want to start calculating after the first 24hrs - HELP!! Or do I have to change time in to numbers? I am trying to edit a basic time card in Excel made by others. I put the time in: ie: Cell G:25, I want to write: 0800, and it fill in as 8:00, then Cell G:26 write 1300, and it fill 1:00, Cell G:27 write 1330, fill 1:30, Cell G:28 1630, fill 4:30. Then Cell G:29 totals how many hours I worked that day. 8.00. And finally in Cell M:29 a total of how many hours were worked that day. I apologize if I don't make sense, but any help would be amazing! It says: If A1 is not empty enter current date, otherwise enter "Empty". Format the first cell, second column as DATE with the time included. You can enter any text you deem appropriate in place of "Empty". is there any formatting or other option to support my requirement please. can anyone say me how i can convert 0:00 to 00:00 until to 9.
custom format like d hh:mm:ss in order to complete an in cell calculation. How can this be done ? I need to calculate the difference between the 2 time periods so that I can then average this amongst all of the tickets that were closed. Can anyone help me? Let's say 12/28/2018 is in A1 and 1/7/2019 is in A2 and the number of tickets (let's it is 400) is in A3. =((A2-A1)*24+INT((((A2-A1)*24)-INT((A2-A1)*24))*60))/A3 will give you 0.668875, which is the number of minutes per ticket. Multiplying that number by 60 gives you 40.1325 seconds per ticket, on average. I want to determine if the current time is between two preset times. Let's say I want to know if the current time is between 10:00 (in A1) and 11:00 (in A2). If it is currently 10:30 and I enter "=now()>A1", I get a return of "TRUE". But if I then enter "=now()<A2", I get "FALSE". Why is that?